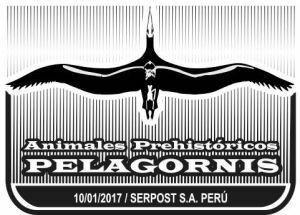 Peru 2017 "Fossils of Prehistoric animals: Palagornis"
At the end of 2016, Serpost presented several new stamps on their Internet site, unfortunately without any detail . Most of it arrived at postal desks in Peru on beginning of 2017. 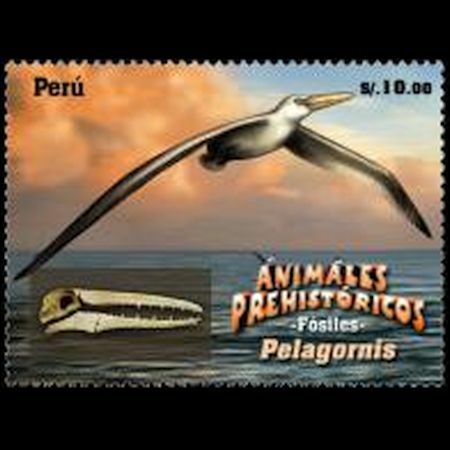 Later on the stamp appeared in stamp catalog of Serpost with issue date of January 10, 2017. center Pelagornis sandersi is an extinct species of flying bird with a wingspan estimated to be between 6.1 and 7.4 m. If the larger estimated wingspan holds true, this makes it the largest flying bird yet discovered, with a wingspan twice as large as the living flying bird with the largest wingspan, the wandering albatross. When excavations began on a new terminal for the Charleston International Airport in 1983, a volunteer for the Charleston Museum, James Malcom discovered a new fossil for what would go on to be called the Palagornis sandersi. Named for the museum's curator, Albert Sanders, the P. sandersi's skull had tooth-like spikes in the jaws, which indicated that the fossil was from a previously unknown species of Pelagornithidae, a group of giant seabirds that went extinct in the Pliocene era. The Pelagornithidae seem to be some of the most efficient flyers ever, and they have been found on all seven continents, ruling for tens of millions of years.